I would like to introduce you to William Weir Bridges and his new bride, Lenna May White. As I continue to scan photos for others, this one caught my attention for some reason and I wanted to make it available here. I really do not know anything about them other than their names. Some quick research tells me William Weir Bridges was born 15 April 1891 in Ogden, Weber, Utah and died 9 May 1959 in Salt Lake City, Salt Lake, Utah. He is buried in Sandy, Salt Lake, Utah although I do not know which cemetery. This photo is likely in the collection because Will’s mother is Janet Fyfe (aka Fife)(1873-1953), half-sister to Agnes Fyfe (1903-1994) as referenced by Dale Vern Ashcraft. I have also written of another sister, Charlotte Fyfe. Lenna “Lena” May White was born 30 March 1898 in Salt Lake City and died 7 June 1974 in Murray, Salt Lake, Utah. She is also buried in Sandy. 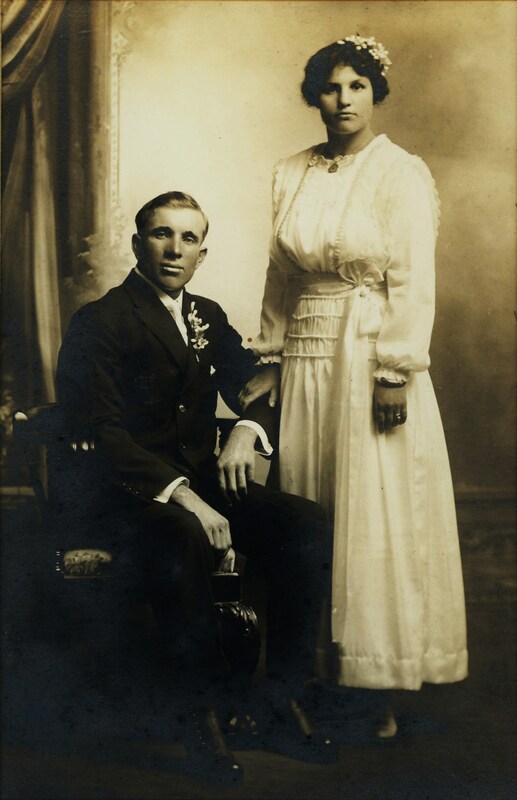 The two married 1 July 1915 in the Salt Lake City LDS Temple. This photo was likely taken near their wedding date. This entry was tagged Ashcraft, Bridges, Fyfe, Murray, Ogden, Salt Lake City, Sandy, Thomas, Utah, White. Bookmark the permalink. I really love the old wedding dresses, they are unique in every way. Her wedding ring really stands out as well!